The House of Medici (English: /ˈmɛdɪtʃi/ MED-i-chee or UK: /məˈdiːtʃi/ mə-DEE-chee, Italian: [ˈmɛːditʃi]) was an Italian banking family and political dynasty that first began to gather prominence under Cosimo de' Medici in the Republic of Florence during the first half of the 15th century. The family originated in the Mugello region of Tuscany, and prospered gradually until it was able to fund the Medici Bank. This bank was the largest in Europe during the 15th century, and it facilitated the Medicis' rise to political power in Florence, although they officially remained citizens rather than monarchs until the 16th century. The Medici family came from the agricultural Mugello region north of Florence, and they are first mentioned in a document of 1230. The origin of the name is uncertain. Medici is the plural of medico, meaning "medical doctor". The dynasty began with the founding of the Medici Bank in Florence in 1397. For most of the 13th century, the leading banking center in Italy was Siena. But in 1298, one of the leading banking families of Europe, the Bonsignoris, went bankrupt, and the city of Siena lost its status as the banking center of Italy to Florence. Until the late 14th century, prior to the Medici, the leading family of Florence was the House of Albizzi. In 1293, the Ordinances of Justice were enacted; effectively, they became the constitution of the Republic of Florence throughout the Italian Renaissance. The city's numerous luxurious palazzi were becoming surrounded by townhouses built by the prospering merchant class. The main challengers to the Albizzi family were the Medicis, first under Giovanni di Bicci de' Medici, later under his son Cosimo di Giovanni de' Medici and great-grandson, Lorenzo de' Medici. The Medici controlled the Medici Bank—then Europe's largest bank—and an array of other enterprises in Florence and elsewhere. In 1433, the Albizzi managed to have Cosimo exiled. The next year, however, a pro-Medici Signoria (civic government) led by Tommaso Soderini, Oddo Altoviti and Lucca Pitti was elected and Cosimo returned. The Medici became the city's leading family, a position they would hold for the next three centuries. Florence remained a republic until 1537, traditionally marking the end of the High Renaissance in Florence, but the instruments of republican government were firmly under the control of the Medici and their allies, save during intervals after 1494 and 1527. Cosimo and Lorenzo rarely held official posts but were the unquestioned leaders. The Medici family was connected to most other elite families of the time through marriages of convenience, partnerships, or employment, so the family had a central position in the social network: several families had systematic access to the rest of the elite families only through the Medici, perhaps similar to banking relationships. Some examples of these families include the Bardi, Altoviti, Ridolfi, Cavalcanti and the Tornabuoni. This has been suggested as a reason for the rise of the Medici family. Members of the family rose to some prominence in the early 14th century in the wool trade, especially with France and Spain. Despite the presence of some Medici in the city's government institutions, they were still far less notable than other outstanding families such as the Albizzi or the Strozzi. One Salvestro de' Medici was speaker of the woolmakers' guild during the Ciompi revolt of 1378-82, and one Antonio de' Medici was exiled from Florence in 1396. Involvement in another plot in 1400 caused all branches of the family to be banned from Florentine politics for twenty years, with the exception of two. Giovanni di Bicci de' Medici (c. 1360–1429), son of Averardo de' Medici (1320-1363), increased the wealth of the family through his creation of the Medici Bank, and became one of the richest men in the city of Florence. Although he never held any political office, he gained strong popular support for the family through his support for the introduction of a proportional system of taxation. Giovanni's son Cosimo the Elder, Pater Patriae (father of the country), took over in 1434 as gran maestro (the unofficial head of the Florentine Republic). Three successive generations of the Medici — Cosimo, Piero, and Lorenzo — ruled over Florence through the greater part of the 15th century. They clearly dominated Florentine representative government without abolishing it altogether. These three members of the Medici family had great skills in the management of so "restive and independent a city" as Florence. When Lorenzo died in 1492, however, his son Piero proved quite incapable of responding successfully to challenges caused by the French invasion of Italy in 1492, and within two years, he and his supporters were forced into exile and replaced with a republican government. Piero de' Medici (1416–1469), Cosimo's son, was only in power for five years (1464–1469). He was called "Piero the Gouty" because of the gout that pained his foot and led to his death. Unlike his father, Piero had little interest in the arts. Due to his illness, he mostly stayed at home bedridden, and therefore did little to further the Medici control of Florence while in power. As such, Medici rule stagnated until the next generation, when Piero's son Lorenzo took over. Lorenzo de' Medici (1449–1492), called "the Magnificent", was more capable of leading and ruling a city, but he neglected the family banking business, which led to its ultimate ruin. To ensure the continuance of his family's success, Lorenzo planned his children's future careers for them. He groomed the headstrong Piero II to follow as his successor in civil leadership; Giovanni (future Pope Leo X) was placed in the church at an early age; and his daughter Maddalena was provided with a sumptuous dowry to make a politically advantageous marriage to a son of Pope Innocent VIII that cemented the alliance between the Medici and the Roman branches of the Cybo and Altoviti families. The Pazzi conspiracy of 1478 was an attempt to depose the Medici family by killing Lorenzo with his younger brother Giuliano during Easter services; the assassination attempt ended with the death of Giuliano and an injured Lorenzo. The conspiracy involved the Pazzi and Salviati families, both rival banking families seeking to end the influence of the Medici, as well as the priest presiding over the church services, the Archbishop of Pisa, and even Pope Sixtus IV to a degree. The conspirators approached Sixtus IV in the hopes of gaining his approval, as he and the Medici had a long rivalry themselves, but the pope gave no official sanction to the plan. Despite his refusal of official approval, the pope nonetheless allowed the plot to proceed without interfering, and, after the failed assassination of Lorenzo, also gave dispensation for crimes done in the service of the church. After this, Lorenzo adopted his brother's illegitimate son Giulio de' Medici (1478–1535), the future Pope Clement VII. Unfortunately, all of Lorenzo's careful planning fell apart to some degree under his incompetent son Piero II, who took over as the head of Florence after his father's death. 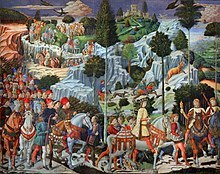 Piero was responsible for the expulsion of the Medici from 1494 to 1512. The Medici additionally benefited from the discovery of vast deposits of alum in Tolfa in 1461. Alum is essential as a mordant in the dyeing of certain cloths and was used extensively in Florence, where the main industry was textile manufacturing. Before the Medicis, the Turks were the only exporters of alum, so Europe was forced to buy from them until the discovery in Tolfa. 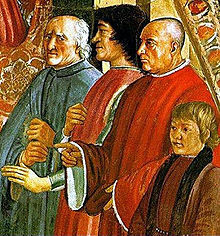 Pius II granted the Medici family a monopoly on the mining there, making them the primary producers of alum in Europe. — Lorenzo de' Medici, 1479. The exile of the Medici lasted until 1512, after which the "senior" branch of the family — those descended from Cosimo the Elder — were able to rule until the assassination of Alessandro de' Medici, first Duke of Florence, in 1537. This century-long rule was interrupted only on two occasions (between 1494–1512 and 1527–1530), when anti-Medici factions took control of Florence. Following the assassination of Duke Alessandro, power passed to the "junior" Medici branch — those descended from Lorenzo the Elder, the youngest son of Giovanni di Bicci, starting with his great-great-grandson Cosimo I "the Great." Cosimo and his father started the Medici foundations in banking and manufacturing – including a form of franchises. The family's influence grew with its patronage of wealth, art, and culture. Ultimately, it reached its zenith in the papacy and continued to flourish for centuries afterward as Dukes of Florence and Tuscany. At least half, probably more, of Florence's people were employed by the Medici and their foundational branches in business. The Medici became leaders of Christendom through their two famous 16th century popes, Leo X and Clement VII. Both also served as de facto political rulers of Rome, Florence, and large swaths of Italy known as the Papal States. They were generous patrons of the arts who commissioned masterpieces such as Raphael's Transfiguration and Michelangelo's The Last Judgment; however, their reigns coincided with troubles for the Vatican, including Martin Luther's Protestant Reformation and the infamous sack of Rome in 1527. Leo X's fun-loving pontificate bankrupted Vatican coffers and accrued massive debts. From Leo's election as pope in 1513 to his death in 1521, Florence was overseen, in turn, by Giuliano de' Medici, Duke of Nemours, Lorenzo de' Medici, Duke of Urbino, and Giulio de' Medici, the latter of whom became Pope Clement VII. Clement VII's tumultuous pontificate was dominated by a rapid succession of political crises - many long in the making - that resulted in the sack of Rome by the armies of Holy Roman Emperor Charles V in 1527 and rise of the Salviati, Altoviti and Strozzi as the leading bankers of the Roman Curie. From the time of Clement's election as pope in 1523 until the sack of Rome, Florence was governed by the young Ippolito de' Medici (future cardinal and vice-chancellor of the Holy Roman Church), Alessandro de' Medici (future duke of Florence), and their guardians. In 1530, after allying himself with Charles V, Pope Clement VII succeeded in securing the engagement of Charles V's daughter Margeret of Austria to his illegitimate nephew (reputedly his son) Alessandro de' Medici. Clement also convinced Charles V to name Alessandro as duke of Florence. Thus began the reign of Medici monarchs in Florence, which lasted two centuries. After securing Alessandro de' Medici's dukedom, Pope Clement VII married off his first cousin, twice removed, Catherine de' Medici, to the son of Emperor Charles V's arch-enemy, King Francis I of France - the future King Henry II. This led to the transfer of Medici blood, through Catherine's daughters, to the royal family of Spain through Elisabeth of Valois, and the House of Lorraine through Claude of Valois. In 1534, following a lengthy illness, Pope Clement VII died - and with him the stability of the Medici's "senior" branch. In 1535, Ippolito Cardinal de' Medici died under mysterious circumstances. In 1536, Alessandro de' Medici married Charles V's daughter, Margaret of Austria; however, the following year he was assassinated by a resentful cousin, Lorenzino de' Medici. The deaths of Alessandro and Ippolito enabled the Medici's "junior" branch to lead Florence. The outstanding figure of the 16th-century Medici family was Cosimo I, who rose from relatively modest beginnings in the Mugello to attain supremacy over the whole of Tuscany. Against the opposition of Catherine de' Medici, Paul III and their allies, he prevailed in various battles to conquer Florence's hated rival Siena and found the Grand Duchy of Tuscany. Cosimo purchased a portion of the island of Elba from the Republic of Genoa and based the Tuscan navy there. He died in 1574, succeeded by his eldest surviving son Francesco, whose inability to produce male heirs led to the succession of his younger brother, Ferdinando, upon his death in 1587. Francesco married Johanna of Austria, and with his consort produced Eleonora de' Medici, Duchess of Mantua, and Marie de' Medici, Queen of France and Navarre. Through Marie, all succeeding French monarchs (bar the Napoleons) were descended from Francesco. Ferdinando eagerly assumed the government of Tuscany. He commanded the draining of the Tuscan marshlands, built a road network in southern Tuscany and cultivated trade in Livorno. To augment the Tuscan silk industry, he oversaw the planting of mulberry trees along the major roads (silk worms feed on mulberry leaves). 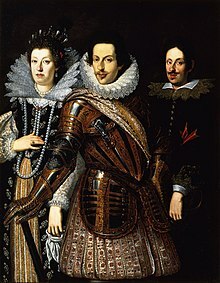 In foreign affairs, he shifted Tuscany away from Habsburg hegemony by marrying the first non-Habsburg marriage candidate since Alessandro, Christina of Lorraine, a granddaughter of Catherine de' Medici. The Spanish reaction was to construct a citadel on their portion of the island of Elba. To strengthen the new Franco-Tuscan alliance, he married his niece, Marie, to Henry IV of France. Henry explicitly stated that he would defend Tuscany from Spanish aggression, but later reneged, after which Ferdinando was forced to marry his heir, Cosimo, to Maria Maddalena of Austria to assuage Spain (where Maria Maddalena's sister Margaret was the incumbent Queen consort). Ferdinando also sponsored a Tuscan expedition to the New World with the intention of establishing a Tuscan colony, an enterprise that brought no result for permanent colonial acquisitions. Despite all of these incentives for economic growth and prosperity, the population of Florence at the dawn of the 17th century was a mere 75,000, far smaller than the other capitals of Italy: Rome, Milan, Venice, Palermo and Naples. Francesco and Ferdinando, due to lax distinction between Medici and Tuscan state property, are thought to have been wealthier than their ancestor, Cosimo de' Medici, the founder of the dynasty. The Grand Duke alone had the prerogative to exploit the state's mineral and salt resources, and the fortunes of the Medici were directly tied to the Tuscan economy. Cosimo's elder son, Ferdinando, was not yet of legal maturity to succeed him, thus Maria Maddalena and his grandmother, Christina of Lorraine, acted as regents. Their collective regency is known as the Turtici. Maria Maddelana's temperament was analogous to Christina's, and together they aligned Tuscany with the papacy, re-doubled the Tuscan clergy, and allowed the heresy trial of Galileo Galilei to occur. Upon the death of the last Duke of Urbino (Francesco Maria II), instead of claiming the duchy for Ferdinando, who was married to the Duke of Urbino's granddaughter and heiress, Vittoria della Rovere, they permitted it to be annexed by Pope Urban VIII. In 1626, they banned any Tuscan subject from being educated outside the Grand Duchy, a law later overturned, but resurrected by Maria Maddalena's grandson, Cosimo III. Harold Acton, an Anglo-Italian historian, ascribed the decline of Tuscany to the Turtici regency. Grand Duke Ferdinado was obsessed with new technology, and had a variety of hygrometers, barometers, thermometers, and telescopes installed in the Palazzo Pitti. In 1657, Leopoldo de' Medici, the Grand Duke's youngest brother, established the Accademia del Cimento, organized to attract scientists to Florence from all over Tuscany for mutual study. Ferdinando's marriage to Vittoria della Rovere produced two children: Cosimo III de' Medici, Grand Duke of Tuscany, and Francesco Maria de' Medici, Duke of Rovere and Montefeltro. Upon Vittoria's death in 1694, her allodial possessions, the Duchies of Rovere and Montefeltro, passed to her younger son. Cosimo III married Marguerite Louise d'Orléans, a granddaughter of Henry IV of France and Marie de' Medici. An exceedingly discontented pairing, this union produced three children, notably Anna Maria Luisa de' Medici, Electress Palatine, and the last Medicean Grand Duke of Tuscany, Gian Gastone de' Medici. Johann Wilhelm, Elector Palatine, Anna Maria Luisa's spouse, successfully requisitioned the dignity Royal Highness for the Grand Duke and his family in 1691, despite the fact that they had no claim to any kingdom. Cosimo frequently paid the Holy Roman Emperor, his nominal feudal overlord, exorbitant dues, and he sent munitions to the emperor during the Battle of Vienna. The Medici lacked male heirs, and by 1705, the grand ducal treasury was virtually bankrupt. In comparison to the 17th century, the population of Florence declined by 50%, and the population of the grand duchy as a whole declined by an estimated 40%. Cosimo desperately tried to reach a settlement with the European powers, but Tuscany's legal status was very complicated: the area of the grand duchy formerly comprising the Republic of Siena was technically a Spanish fief, while the territory of the old Republic of Florence was thought to be under imperial suzerainty. Upon the death of his first son, Cosimo contemplated restoring the Florentine republic, either upon Anna Maria Luisa's death, or on his own, if he predeceased her. The restoration of the republic would entail resigning Siena to the Holy Roman Empire, but, regardless, it was vehemently endorsed by his government. Europe largely ignored Cosimo's plan. Only Great Britain and the Dutch Republic gave any credence to it, and the plan ultimately died with Cosimo III in 1723. 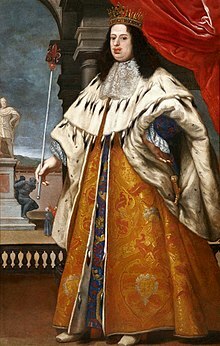 On 4 April 1718, Great Britain, France and the Dutch Republic (also later, Austria) selected Don Carlos of Spain, the elder child of Elisabeth Farnese and Philip V of Spain, as the Tuscan heir. By 1722, the electress was not even acknowledged as heiress, and Cosimo was reduced to spectator at the conferences for Tuscany's future. On 25 October 1723, six days before his death, Grand Duke Cosimo disseminated a final proclamation commanding that Tuscany stay independent: Anna Maria Luisa would succeed uninhibited to Tuscany after Gian Gastone, and the grand duke reserved the right to choose his successor. However, these portions of his proclamation were completely ignored, and he died a few days later. Gian Gastone despised the electress for engineering his catastrophic marriage to Anna Maria Franziska of Saxe-Lauenburg; while she abhorred her brother's liberal policies, he repealed all of his father's anti-Semitic statutes. Gian Gastone revelled in upsetting her. On 25 October 1731, a Spanish detachment occupied Florence on behalf of Don Carlos, who disembarked in Tuscany in December of the same year. The Ruspanti, Gian Gastone's decrepit entourage, loathed the electress, and she them. Duchess Violante of Bavaria, Gian Gastone's sister-in-law, tried to withdraw the grand duke from the sphere of influence of the Ruspanti by organising banquets. His conduct at the banquets was less than regal; he often vomited repeatedly into his napkin, belched, and regaled those present with socially inappropriate jokes. Following a sprained ankle in 1731, he remained confined to his bed for the rest of his life. The bed, often smelling of faeces, was occasionally cleaned by Violante. Anna Maria Luisa signed the Patto di Famiglia ("family pact") on 31 October 1737. In collaboration with the Holy Roman Emperor and Grand Duke Francis of Lorraine, she willed all the personal property of the Medici to the Tuscan state, provided that nothing was ever removed from Florence. The "Lorrainers", as the occupying forces were called, were popularly loathed, but the regent, the Prince de Craon, allowed the electress to live unperturbed in the Palazzo Pitti. She occupied herself with financing and overseeing the construction of the Basilica of San Lorenzo, started in 1604 by Ferdinando I, at a cost to the state of 1,000 crowns per week. The electress donated much of her fortune to charity: £4,000 a month. On 19 February 1743, she died, and the grand ducal line of the House of Medici died with her. The Florentines grieved her, and she was interred in the crypt that she helped to complete, San Lorenzo. The extinction of the main Medici dynasty and the accession in 1737 of Francis Stephen, Duke of Lorraine and husband of Maria Theresa of Austria, led to Tuscany's temporary inclusion in the territories of the Austrian crown. The line of the Princes of Ottajano, an extant branch of the House of Medici who were eligible to inherit the grand duchy of Tuscany when the last male of the senior branch died in 1737, could have carried on as Medici sovereigns but for the intervention of Europe's major powers, which allocated the sovereignty of Florence elsewhere. As a consequence, the grand duchy expired and the territory became a secundogeniture of the Habsburg-Lorraine dynasty. The first grand duke of the new dynasty, Francis I, was a great-great-great-grandson of Francesco I de' Medici, thus he continued the Medicean Dynasty on the throne of Tuscany through the female line. The Habsburgs were deposed in favor of the House of Bourbon-Parma in 1801 (themselves deposed in 1807), but were later restored at the Congress of Vienna. Tuscany became a province of the United Kingdom of Italy in 1861. However, several extant branches of the House of Medici currently continue to exist, including the Princes of Ottajano, the Medici Tornaquinci, and the Verona Medici Counts of Caprara and Gavardo. The greatest accomplishments of the Medici were in the sponsorship of art and architecture, mainly early and High Renaissance art and architecture. The Medici were responsible for a high proportion of the major Florentine works of art created during their period of rule. Their support was critical, since artists generally only began work on their projects after they had received commissions. 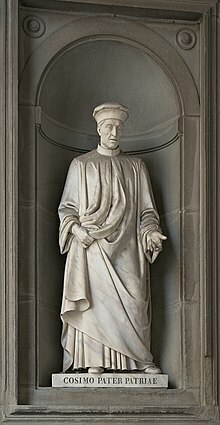 Giovanni di Bicci de' Medici, the first patron of the arts in the family, aided Masaccio and commissioned Filippo Brunelleschi for the reconstruction of the Basilica of San Lorenzo, Florence, in 1419. Cosimo the Elder's notable artistic associates were Donatello and Fra Angelico. In later years, the most significant protégé of the Medici family was Michelangelo Buonarroti (1475–1564), who produced work for a number of family members, beginning with Lorenzo the Magnificent, who was said to be extremely fond of the young Michelangelo and invited him to study the family collection of antique sculpture. Lorenzo also served as patron to Leonardo da Vinci (1452–1519) for seven years. 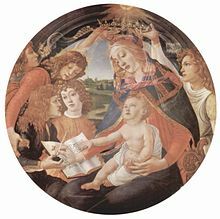 Indeed, Lorenzo was an artist in his own right and an author of poetry and song; his support of the arts and letters is seen as a high point in Medici patronage. After Lorenzo's death, the puritanical Dominican friar Girolamo Savonarola rose to prominence, warning Florentines against excessive luxury. Under Savonarola's fanatical leadership, many great works were "voluntarily" destroyed in the Bonfire of the Vanities (February 7, 1497). The following year, on 23 May 1498, Savonarola and two young supporters were burned at the stake in the Piazza della Signoria, the same location as his bonfire. In addition to commissions for art and architecture, the Medici were prolific collectors and today their acquisitions form the core of the Uffizi museum in Florence. In architecture, the Medici were responsible for some notable features of Florence, including the Uffizi Gallery, the Boboli Gardens, the Belvedere, the Medici Chapel and the Palazzo Medici. Later, in Rome, the Medici popes continued in the family tradition of patronizing artists in Rome. Pope Leo X would chiefly commission works from Raphael, whereas Pope Clement VII commissioned Michelangelo to paint the altar wall of the Sistine Chapel just before the pontiff's death in 1534. Eleanor of Toledo, a princess of Spain and wife of Cosimo I the Great, purchased the Pitti Palace from Buonaccorso Pitti in 1550. Cosimo in turn patronized Vasari, who erected the Uffizi Gallery in 1560 and founded the Accademia delle Arti del Disegno – ("Academy of the Arts of Drawing") in 1563. Marie de' Medici, widow of Henry IV of France and mother of Louis XIII, is the subject of a commissioned cycle of paintings known as the Marie de' Medici cycle, painted for the Luxembourg Palace by court painter Peter Paul Rubens in 1622–23. Although none of the Medici themselves were scientists, the family is well known to have been the patrons of the famous Galileo Galilei, who tutored multiple generations of Medici children and was an important figurehead for his patron's quest for power. Galileo's patronage was eventually abandoned by Ferdinando II, when the Inquisition accused Galileo of heresy. However, the Medici family did afford the scientist a safe haven for many years. Galileo named the four largest moons of Jupiter after four Medici children he tutored, although the names Galileo used are not the names currently used. 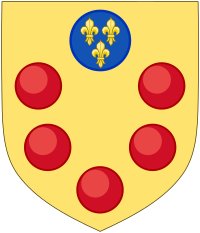 The origin of the Medici coat of arms is not recorded. One unproven story traces their ancestry to a knight of Charlemagne's, Averardo, who defeated a giant, Mugello. In reward, Charlemagne is said to have rewarded Averardo with the shield mauled by the giant, with the dents in the shape of balls, and the giant's lands in Mugello. As an Italian vocabulary word, "medici" means "medical doctors". So, another fanciful story depicts the balls as pills or cupping glasses (a late-medieval medical instrument used to draw blood). The most likely theories, however, are that the balls originally represent coins copied from the coat of arms of the Guild of Moneychangers (Arte del Cambio) to which the Medici belonged. That shield was red strewn with Byzantine coins (bezants). The number of balls also varied with time, as shown below. ^ Litta, Pompeo (1827). Famiglie celebri italiane. Medici di Firenze. ^ Luisa Greco (22 May 2015). "Cosimo de Medici e l'amore per le tartarughe con la vela". Toctoc. ^ "Medici Family – - Encyclopædia Britannica". Encyclopædia Britannica. Retrieved 27 September 2009. ^ Malaguzzi, Silvia (February 24, 2004). "Botticelli. Ediz. Inglese". Giunti Editore – via Google Books. ^ The name in Italian is pronounced with the stress on the first syllable /ˈmɛ .di.tʃi/ and not on the second vowel.How to say: Medici, BBC News Magazine Monitor—MED-uh-chee in American English. ^ "History of Florence". Aboutflorence.com. Retrieved 2015-01-26. ^ Crum, Roger J. Severing the Neck of Pride: Donatello's "Judith and Holofernes" and the Recollection of Albizzi Shame in Medicean Florence . Artibus et Historiae, Volume 22, Edit 44, 2001. pp. 23–29. ^ Padgett, John F.; Ansell, Christopher K. (May 1993). "Robust Action and the Rise of the Medici, 1400–1434". The American Journal of Sociology. 98 (6): 1259–1319. doi:10.1086/230190. JSTOR 2781822. . This has led to much more analysis. ^ Machiavelli, Niccolò (1906). The Florentine history written by Niccolò Machiavelli, Volume 1. p. 221. .
^ Bradley, Richard (executive producer) (2003). The Medici: Godfathers of the Renaissance (Part I) (DVD). PBS Home Video. ^ a b The Prince Niccolò Machiavelli. A Norton Critical Edition. Translated and edited by Rober M. Adams. New York. W.W. Norton and Company, 1977. p. viii (Historical Introduction). ^ Ulwencreutz, Lars (November 30, 2013). "Ulwencreutz's The Royal Families in Europe V". Retrieved 20 September 2018. ^ Hibbard, pp. 177, 202, 162. ^ Halvorson, Michael (2014-08-29). The Renaissance: All That Matters. Hodder & Stoughton. ISBN 9781444192964. ^ Hibbert, The House of Medici: Its Rise and Fall, 153. ^ a b Hale, p. 150. ^ Austria and Spain were ruled by the House of Habsburg; the two are interchangeable terms for the Habsburg domains in the time period in question. ^ a b Hale, p. 160. ^ a b Acton, p. 192. ^ a b Hale, p. 180. ^ "Anna Maria Luisa de' Medici – Electress Palatine". Retrieved 3 September 2009. ^ Howard Hibbard, Michelangelo (New York: Harper and Row, 1974), p. 21. ^ Three more sons: Talento (?-? ), he had a son, Mario died in 1369, Mario had few unremarkable later generations; Jacopo (?-1340) who had a son, Averardo (fl. 1363); Francesco (?-? ), who had a son, Malatesta died in 1367. ^ Four sons: Guccio (from which descended a line extinct in 1670 with Ottaviano), Filippo (?-? ), Betto (fl. 1348), Ardinghello (fl. 1345). ^ One more son: Giovanni (fl. 1383). Giovanni had a son, Antonio (?-1396) and a nephew, Felice (?-?). ^ One son, Coppo, (?-?). Cfr. Mecatti, Giuseppe Maria; Muratori, Lodovico Antonio (1755). Storia cronologica della città di Firenze (in Italian). Parte prima. Naples: Stamperia Simoniana. p. 157. Retrieved March 28, 2016. ^ Two more brothers unknown. ^ Two more brothers: Andrea (*? †? ), Bartolomeo (*? †?). ^ One more brother: Pietro (*? †? ), line extinct. ^ de Roover, Raymond (July 31, 2017). The Medici Bank: Its Organization, Management, Operations, and Decline. Pickle Partners Publishing. pp. note 1. ^ Mackworth-Young, Rose (29 March 2012). "The Medici balls: Origins of the family's coat of arms". The Florentine. Florence: B'Gruppo Srl (160). Retrieved 17 October 2017.